Amid this turmoil arrives Jacob Solomon, a fellow artist for whom Dez feels an immediate and strong attraction. As their relationship reaches a pivotal moment, a man is found dead and the town accuses Jacob, a Jewish outsider. But the tide turns when Dez’s idea for a series of painted postcards is picked up by The American Sunday Standard and she abruptly finds herself back on the path to independence. New York City and a life with Jacob both beckon, but what will she have to give up along the way? This book has a lot going on. There is filial duty, art, marriage, illicit love, bigotry, bankruptcy and the threat of losing a lovely little town due to the thirsty residents of Boston. Dez feels an immediate connection with the fellow artist Jacob. Their romance felt a bit forced but it's understandable why they are attracted to one another and it does add another layer to this tale. 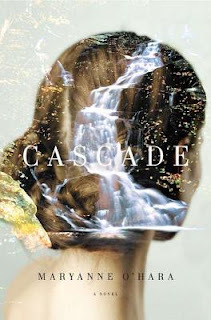 Cascade is about obligations and dreams and one woman's struggle to balance the two. Even though this story takes place in the 30's I think it's message is as timely as ever. And would you take a look at that cover? Stunning! It really is a wonderful book :) Good luck! You're welcome Nancy, thanks for entering! I've seen this book bouncing around the book blogs and I have to say that I am intrigued! Sounds pretty good! Yay - a giveaway! Same here Marie ;) I know we're not supposed to judge a book by its cover but...who can help it?? Howdy :D It really is a great cover, and I've read some fairly good reviews about this book, so I would not mind reading it, too. I've actually read that one as well! I think the cover was what initially drew me to the book :) It's been a long while but I remember liking it. Thanks for stopping by! I read this last year... well, listened to the audio but that counts too! I had seen the book trailer and it was so good I just had to read it. I've had my eye on this one for a while but haven't had a chance to read it yet--sounds great! Thanks for the review and contest. Good luck Beth! This is a good read, I think you'd like it. I've loved this cover since I first saw the book, but heard different things - sounds like one I have to read for myself. The cover is amazing isn't it? So pretty! I recently read this one myself and thought it was excellent. The story has definitely left an impression on me. I've got this to read and looking forward to it. The cover is what got me, so different! I can't wait to hear what you think of it Charlie! I' d love to read the story of an artist in the 1930 period, could not have been easy for women artists in the 30's. An another author Kate W. suggested me her book to read! Thank you for the giveaway , I hope it includes Canadian readers! You're welcome Nicole :) And yes, Canadian readers are included! I enjoyed Cascade too and I fell in love with the cover. Nice review! Thank you Naida :) This cover knocks my socks off! I agree that the cover is stunning and I enjoy a good historical fiction. Thanks for the chance to win! You're welcome Tanya, good luck! It was a lovely read Mary, good luck! Thanks for your lovely review of my book, Jennifer. I appreciate that you took the time. Thank you for the review. I don't know whether this is open to all. If so please count me in! Ack, I loved this book so much. Such a unique and haunting story -- definitely one I will remember for quite a while! And yes, that cover is exquisite. Can't get enough of it! I need a poster of it I think ;) It's so awesome! So many entries! I hope that those of you who don't win will still read and enjoy it. Jennifer, for book readings, I use a copy of the book jacket printed and stretched on an artist's canvas, and placed on an easel. It's a great display ! It must be! The cover is one of the best I've seen! Will definitely read it, but still crossing my fingers that I win! Looooove the cover! Sounds like a great read, too. Thanks for hosting this giveaway! You betcha! Good luck Monika! I JUST added this one to my wishlist this morning! Happy days! Well what do you know :) Perhaps you'll win this one! I've seen this book around quite a lot - the cover really draws the eye, it's beautiful! - but I hadn't really looked into what it was about before. Thanks for the review, and the giveaway!